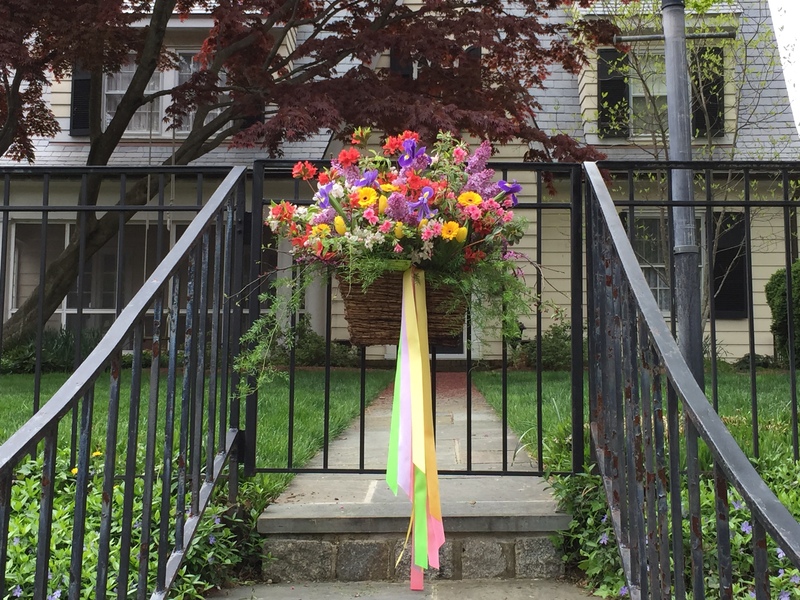 I can’t believe it’s May Basket time again already! This is one of my favorite days to be an Annapolitan. 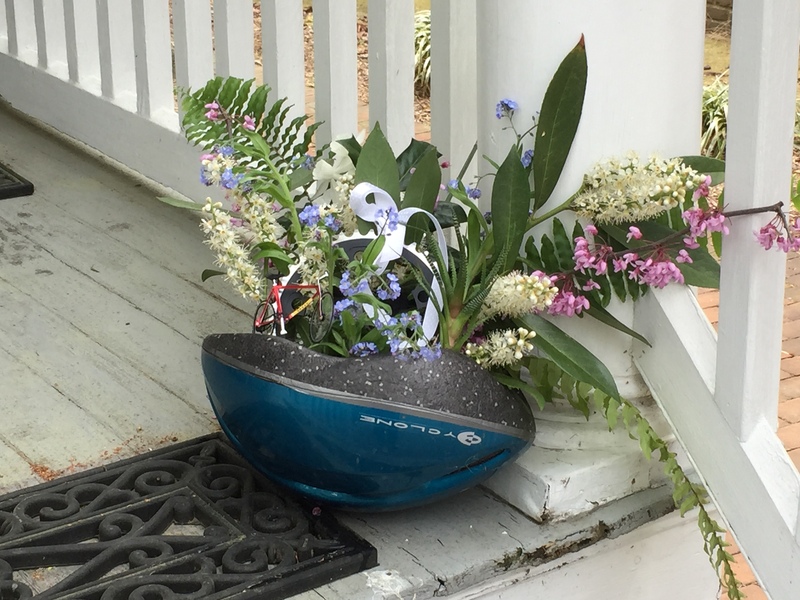 This year, I made a more whimsical basket than I have in the past. 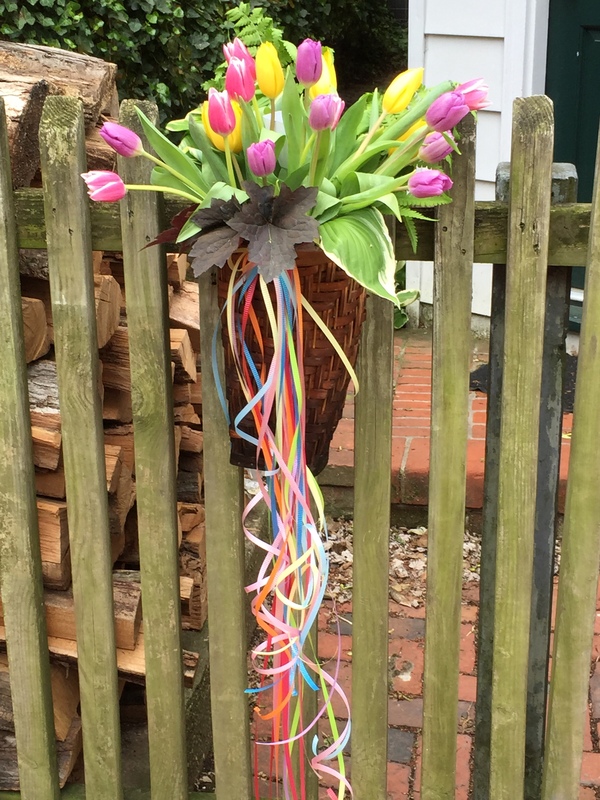 I used a single kind of flower, which is the only way to go for someone who is not a natural at arranging flowers! 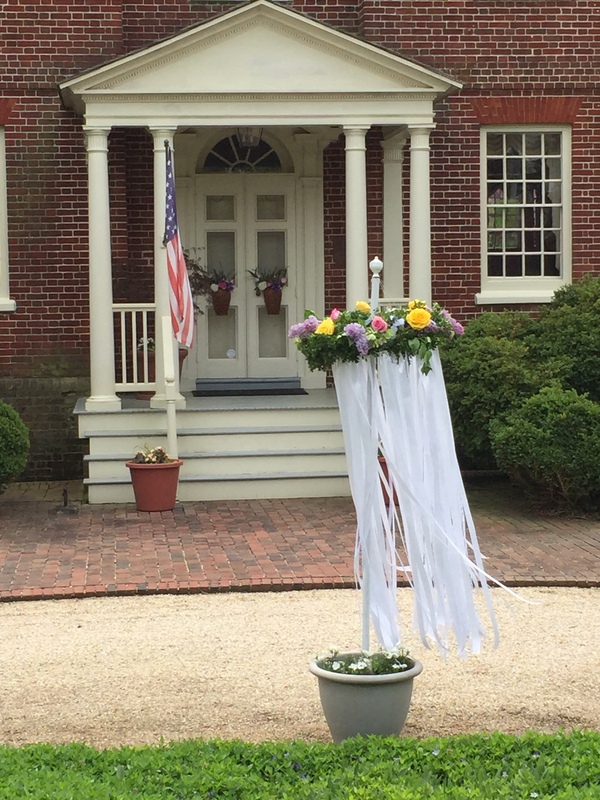 Unfortunately, I mistakenly thought the judging was over and removed my name from the basket too early. 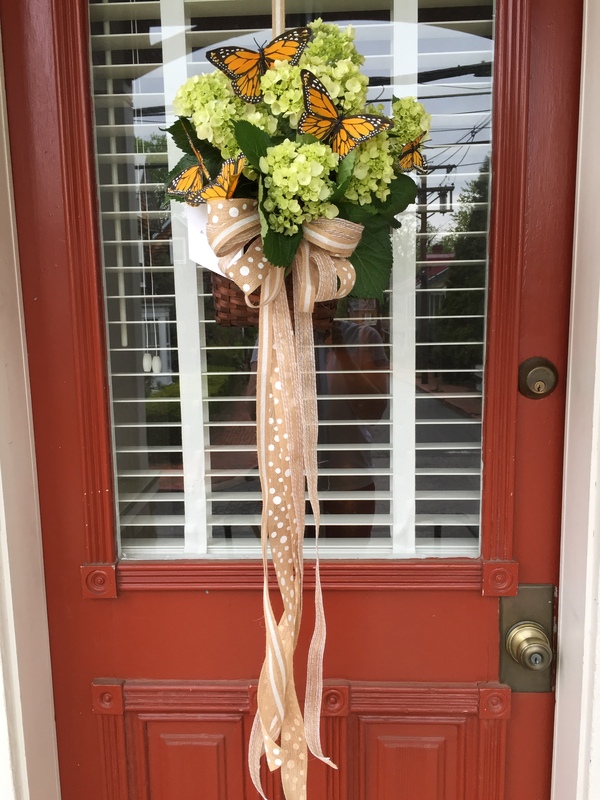 The judges actually hadn’t come around to our street yet, so I missed my chance at a ribbon. Womp womp. Oh well, lesson learned! The point is to have fun and do something as a community, so it is probably a good thing for me to be more focused on that part and less focused on winning something. Here are some others from around the neighborhood. I’ve had a couple of recipe successes lately. First up is a recreation of one of my favorite meals in DC: the Teaism salmon bento box. It has cooked salmon, rice with nori flakes, sweet potatoes with miso sauce, and a cucumber ginger salad. So good! I have no problem giving business to my favorite restaurants, but it’s also nice to have something similar at home without too much effort. 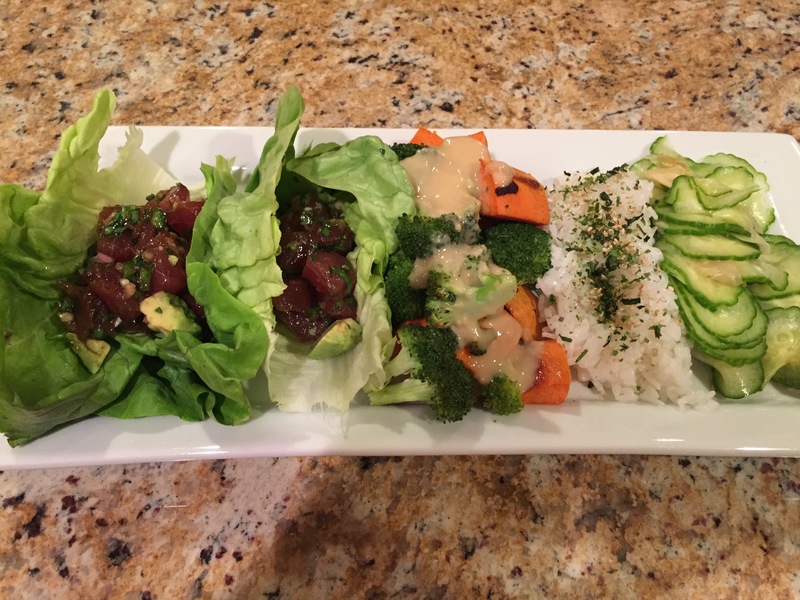 In this version, I replaced the salmon with a tuna poke in lettuce wraps (we’ve also used tea-cured tuna that Tom makes using our sous vide machine). The tuna poke was especially easy because our Whole Foods has started carrying sushi-grade fish in the freezer section. Genius! For the sweet potatoes and broccoli, I just roasted those in a hot oven (about 425, I think) for 20-30 minutes until they were tender. Then I whipped up the miso dressing from this recipe to go with them. I made the cucumber salad earlier in the day so it could marinate in the fridge. I used this recipe, but substituted pickled ginger for the onion since that is what the Teaism version has. Finally, I just made some brown rice using the par-cooked kind from Trader Joe’s and sprinkled some nori mix on top (I bought the mix at Whole Foods). 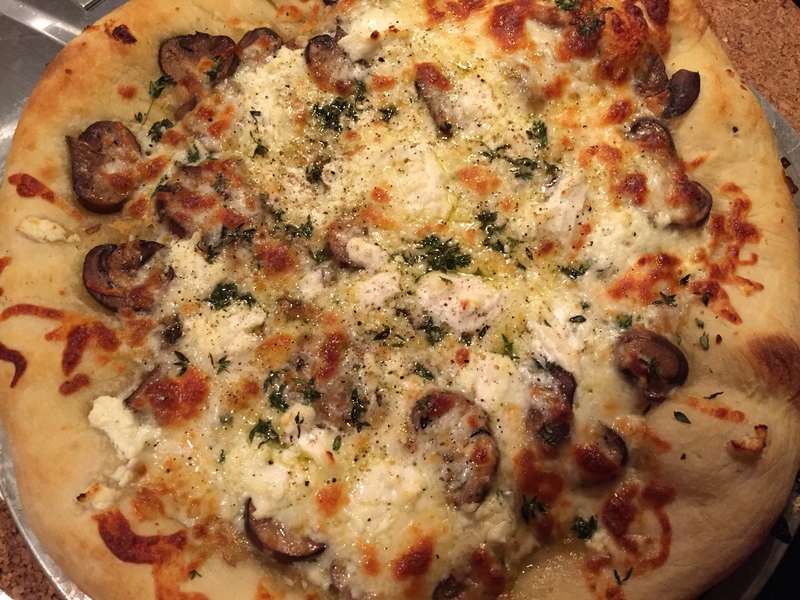 This mushroom pizza is the second yummy thing I’ve made lately. If you pay attention to food blogs at all, you probably saw the Washington Post’s recipe for mushroom confit that basically went viral a couple of weeks ago. I made some, and let me tell you, it is good. This pizza was as delicious as pretty much any mushroom pizza I’ve ever had at a restaurant, and it’s super easy. I rolled out a ball of Trader Joe’s pizza dough and brushed it with some of the oil from the mushrooms. Then I spread the mushrooms themselves all over the crust, and sprinkled the whole thing with some crumbled goat cheese. I topped all of that with some mozzarella, fresh thyme, and flaked sea salt. I went fancy with this version and used smoked salt, but you totally don’t need to. I baked the pizza on a pizza stone in our oven at 450 for about 12 minutes until it was bubbly and the cheese had started to brown. PS – I really need to stop posting food pictures with shadow on them. I will work on that. In the meantime, forgive? is it hot in here, or is that just me? Most of the breast-cancer portion of this blog is here. I’m still dealing with treatment side effects, though, so I thought I’d talk about that real quick since it is impacting my running. Fortunately, chemo was not a total nightmare for me. Sure, my hair fell out and I was tired ALL THE TIME, but I’m pretty much back to normal now (almost exactly three months post-chemo). My current issue is with a little jerk called Zoladex. Zoladex is a shot some breast cancer patients get to shut down their ovaries during treatment. Other breast cancer patients get it for literally years after chemo is done. I’m not one of those people, thank goodness, because Zoladex blows. I am still having hot flashes and night sweats even though I haven’t had an injection in three months. My doctor says this is normal, but my hatred of it probably is not. I’m using the words “shot” and “injection” like Zoladex is equivalent to a flu shot or something. Nope. It is actually an implant that gets injected into your lower abdomen with a HUGE needle. Like, the nurse has to numb the area first because the needle is so big. Ugh. Anyway, in addition to getting the vapors constantly, I’ve also put on a bunch of weight because Zoladex messes with my hormones. This is making me a very slow runner. I’m training for a 10K right now, and to say that I am frustrated with my lack of performance is an understatement. I’ve been running pretty consistently for about a month with negligible progress in both pace and distance. The race is on May 30, so I still have time, but I’m starting to get kind of concerned. I can’t even run two miles without having to stop at least twice. My bad runs far outnumber my good ones at this point. I’m not sure what to do besides just keep trudging along until things get better. Ok, enough whining. To be honest, even though I’m not happy with my fitness right now, I’m beyond happy that I am healthy enough to run at all. Things could have turned out differently, and much worse, for me. So complaining time is now over. Until my next bad run, anyway. PS – Did anyone watch the Boston Marathon yesterday? I had it streaming like a big (running) nerd. Watching the elite runners cross the finish line gets me every time. There’s a coffee trend sweeping the nation, y’all. You know it’s legit because you can now get it at Whole Foods. I’m talking about bulletproof coffee (or “mammoth coffee” if you’re ordering it at Whole Foods). Bulletproof coffee is regular black coffee with butter and coconut oil in it. I know, I know. G.R.O.S.S. But stay with me. I was immediately intrigued by the ingredients because, well, butter. My first experience with bulletproof coffee happened about a month ago when I ordered a small mammoth at Whole Foods. I’d heard rumors of coffee with butter in it, but had not heard of the coconut oil aspect before. I figured, what the heck, YOLO. Guys. It was AMAZING. The coffee flavor really came through, and it wasn’t sweet at all. I don’t put sugar in my coffee, so that was a positive in my view, but you could totally add sugar if you want and it would be fine. 1. The coffee needs to be the best quality. The butter and coconut oil enhance the coffee flavor, so good coffee is really important. Also, life is short so you shouldn’t be drinking bad coffee anyway. 2. The other ingredients need to be good, too. Look for high quality butter, in particular. We use Kerrygold grass-fed. 3. Procedure is critical. After my first mammoth, I ordered another one at the same Whole Foods a couple of weeks later. It was made by a different person, and was absolutely terrible. The butter and coconut oil just sat on top like an oil slick. The flavor was totally off, too. The proper procedure is to add the coffee, butter, and coconut oil to a blender and then whir the whole thing together for a few seconds. The blending, along with the addition of refrigerated butter, can cool the coffee off so it’s also important to heat it up a little if that happens. 4. You can make bulletproof coffee at home, but you might want to save it for the weekend. It’s not that the making process is time-consuming. It’s more that you end up with a dirty blender. No one wants to deal with that on their way out the door for work. Another wrinkle can occur if, like us, you use a Chemex to drip brew your coffee. In that case, my earlier statement about the process not taking very long is out the window. 5. There is a debate about whether bulletproof coffee can serve as a meal replacement. I read an article recently where a guy drank bulletproof coffee in the morning instead of eating breakfast for two weeks. Basically, he was starving all the time. So maybe don’t do that. I’ve also found that if I drink it first thing, before I’ve eaten something, I get a stomach ache. 6. Bulletproof coffee makes you feel pretty great. I don’t know what it is, but bulletproof coffee makes me feel extra alert and on top of things. Want to make your own? Just blend two cups of coffee with two tablespoons of butter and two tablespoons of coconut oil. Note: I am going to start cutting back the butter little by little to see if I can tell the difference. Although butter is a magical substance, it is not exactly a health food. I turned 38 yesterday. The latter half of 37 was kind of the worst, which you can read about here, but I have high hopes for 38. Things got off to a great start in the birthday cake department. In the past, I’ve typically requested my mom’s biscuit bread pudding for my birthday. But I’ve also had my share of red velvet cake, and the epitome of Southern dessert, coconut cake. 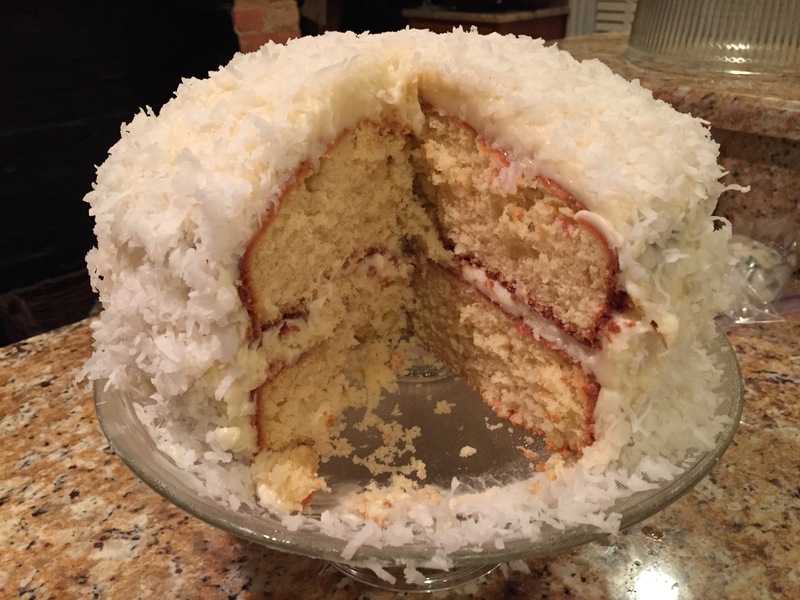 This year, Tom made me an extra-delicious coconut cake with cream cheese frosting. Cream cheese frosting is the best kind, and I don’t want to hear any argument about it. Although I gave up dessert for Lent this year, I’ve already caved and had two enormous pieces. Let’s face it, if I’m going to hell, it won’t be for eating two pieces of cake during Lent. There are plenty of other reasons. Ha! This blog is supposed to be about the good things in life: family, friends, good food, and good times. Alas, life is not always good. On August 13, 2014, I was diagnosed with breast cancer. I am 37 years old. I have a family history on my father’s side, so have always been aware that breast cancer was a possibility for me, but my diagnosis was still a huge shock. I have since learned that I am BRCA1 positive, and am electing to have a double mastectomy. My prognosis is very good, and my amazing doctors all expect that I will fully recover from this and have a long and healthy life. I have decided to add a static page to the blog (right next to “About”) that I will occasionally update with information about my treatment and progress. Otherwise, the blog will be business as usual. After I ran the Zooma Annapolis half marathon back in May, I thought I might be done with that kind of thing. The course was hard, I missed my time goal by a frustratingly small amount, and I considered just checking the half marathon box and calling it done. But, unable to leave well enough alone, I just signed up for the Richmond Half Marathon. It is technically called “The American Family Fitness Half Marathon.” I will not be calling it that because obviously. Anyway, the race is on November 15, which means I have to get on a training plan pretty much immediately. Truthfully, that’s one of the main reasons I signed up. If I don’t have something to motivate me to get up and work out, I tend to sleep in. Not cool. I’m also in an “embrace life” mood lately. I am physically able to run without aggressively hating it (most of the time). I get to be outside breathing air that hasn’t been recirculated by an office HVAC system. I am exposed to natural light for long periods of time. These are good things that add richness to my existence. I should do them. Also, this is a fall race, which means training will be fairly pleasant weather-wise, and the scenery from past races (via the race’s facebook page) show pretty leaves and scenery. The Richmond Half is apparently pretty popular, because it is early August and there are no hotel rooms to be found. Seriously. Every hotel anywhere close to the race start is booked. Let’s just call that Future Katie’s problem. We just got a new cocktail book called Shake. As with many cool, food and beverage-related things these days, the book hails from Brooklyn, NY. The book is sold out on their website, but you can pick it up at Williams-Sonoma like we did, or grab it on Amazon. The photography and layout of the book are some of the best I’ve seen in any cookbook genre. It’s really a pleasure to read, even if you never make any of the recipes in it. But more importantly, the drinks are classic and delicious. We can’t wait to make them all. 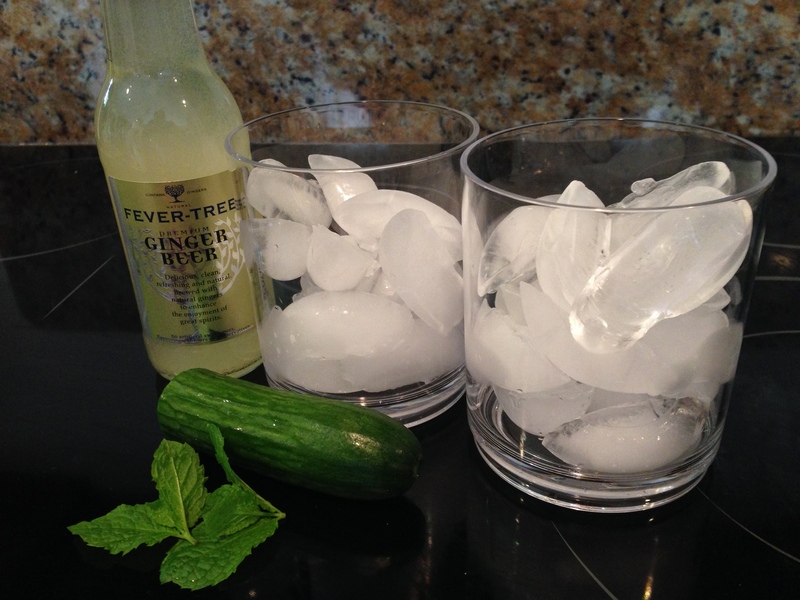 We wound up our weekend by making the Cucumber Rickey because we just happened to have all the ingredients for that. Each recipe makes two drinks, which is perfect. All cocktail recipes should be written that way, in my opinion. Ginger Beer is becoming more widely available. We really like Fever-Tree. The mint is from our garden! I dare you to find a drink more refreshing-looking than these. The cucumber and mint flavors were perfectly balanced, and made the drink taste like an amped up gin and tonic. 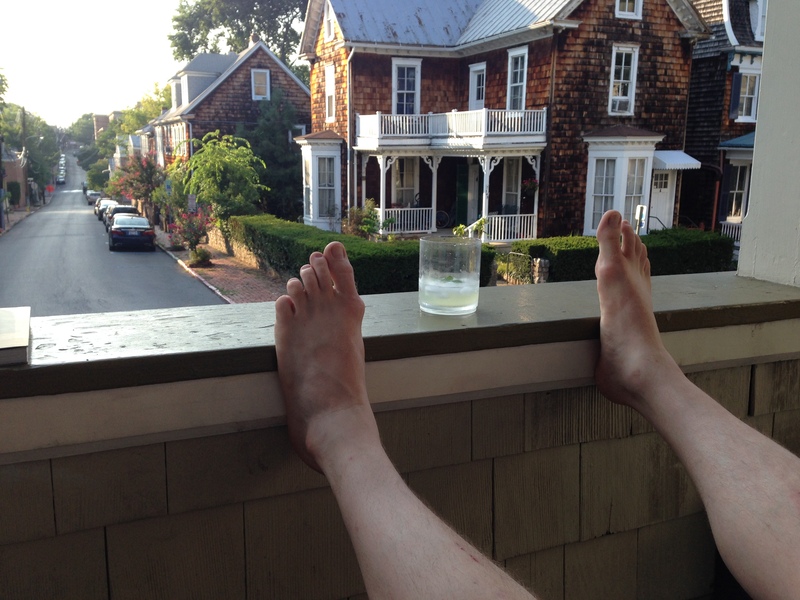 It would be perfect for someone who doesn’t care for a normal G&T. 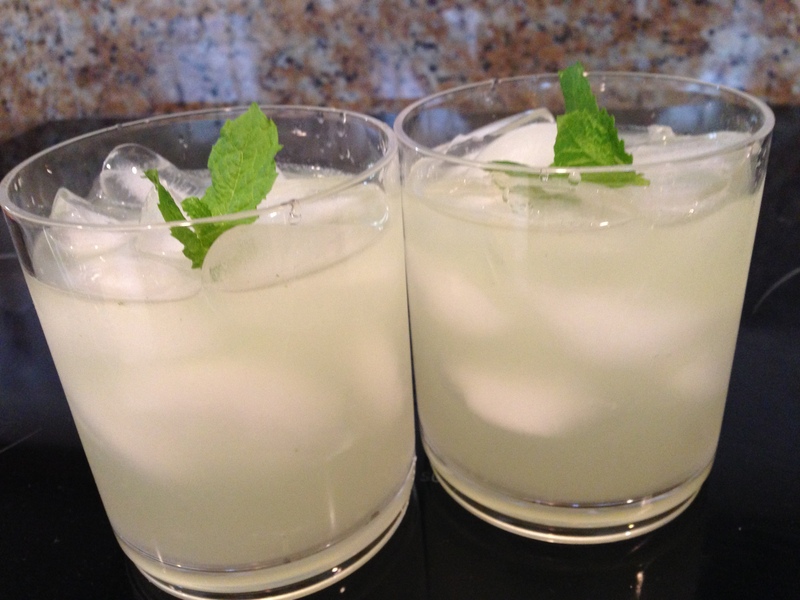 Mint can really overwhelm more delicate flavors, but not so here. The ginger beer didn’t make it overly sweet, either. 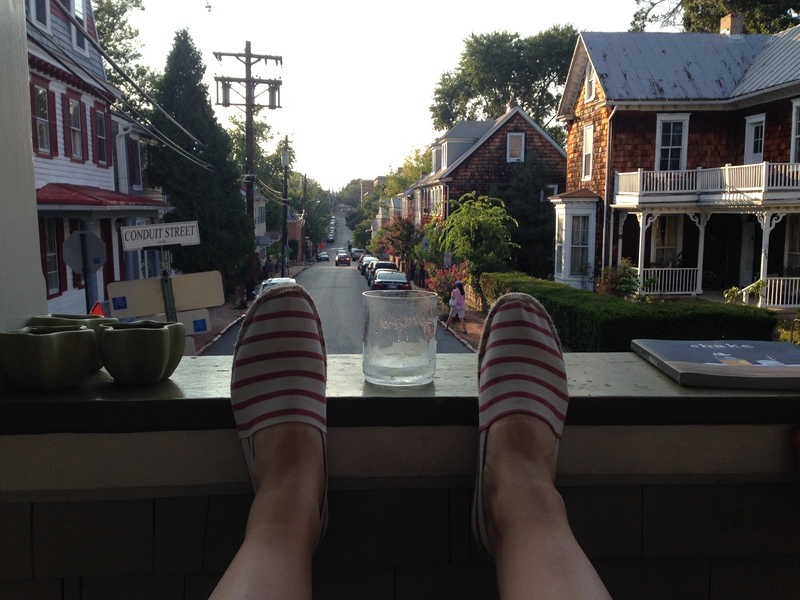 It was just right for sipping on the porch. As I’ve said before, our go-to quick dinner is juevos rancheros. But this week has been busier at work than usual, and we’d already gone to the juevos well by Monday! When we got home long after 8:00 pm last night, we just wanted to bag it. Our rule is that if we can’t get a homemade dinner on the table by 9:00 pm, we eat out. Cooler heads prevailed, however, and we ended up making a healthy, light dinner that tasted great, and was on the table by our deadline. This is a recipe I got from my mom ten years ago. She got it from an ancient issue of Good Housekeeping, and the original recipe is miraculously still available online. I’ve made it a million times and can honestly tell you that it takes literally five minutes. Five minutes, y’all. Over time, I’ve modified the recipe to mix up ingredients and amp up flavor. The current iteration is below. Stock your pantry with a few easy (and inexpensive) items, and you too can have a homemade dinner when it seems impossible! 1. Zest and juice one medium/large lemon into a big mixing bowl. 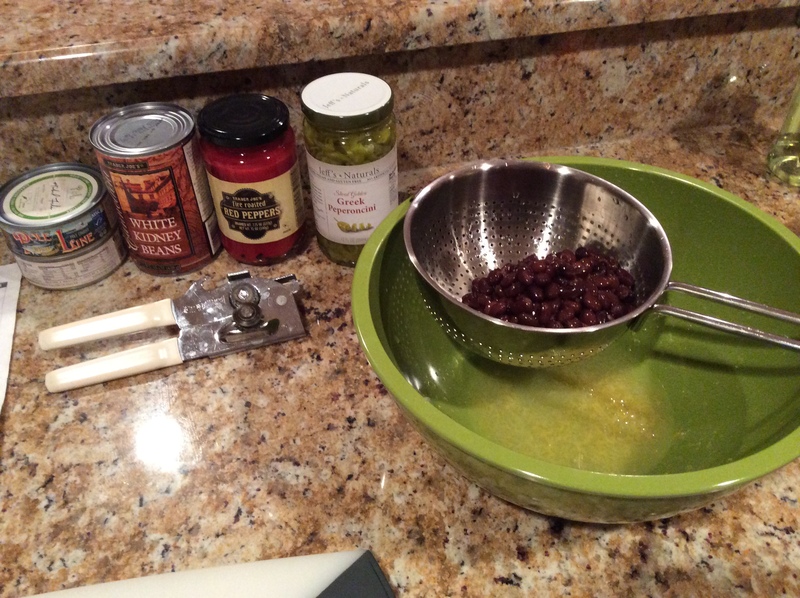 Open a can of black beans, rinse them under cold water, drain, and add to the lemon juice and zest. 2. 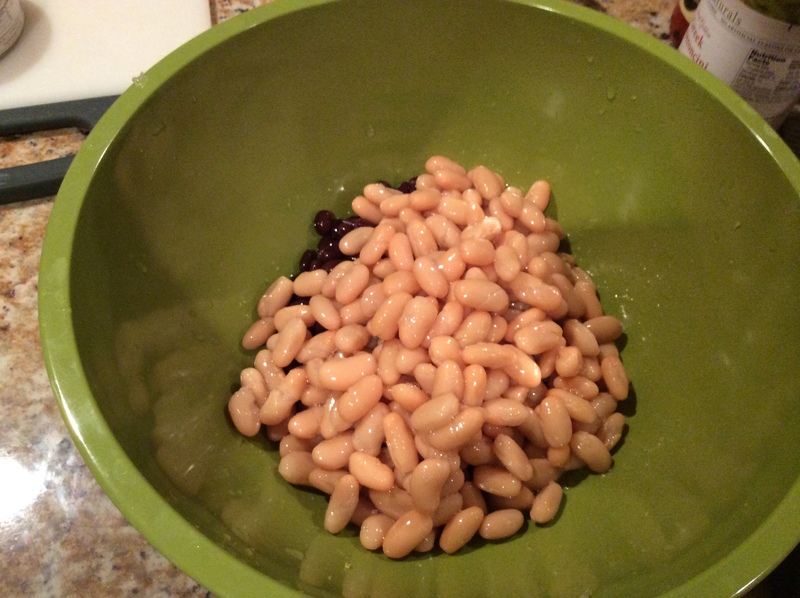 Open a can of cannellini beans, rinse them under cold water, drain, and add to the bowl. 3. Open two cans of tuna packed in olive oil and flake them into the bowl, adding the oil to the bowl along with the fish. I’ve said it before, and I’ll say it again: tuna packed in olive oil, rather than water, is awesome. Buy it. 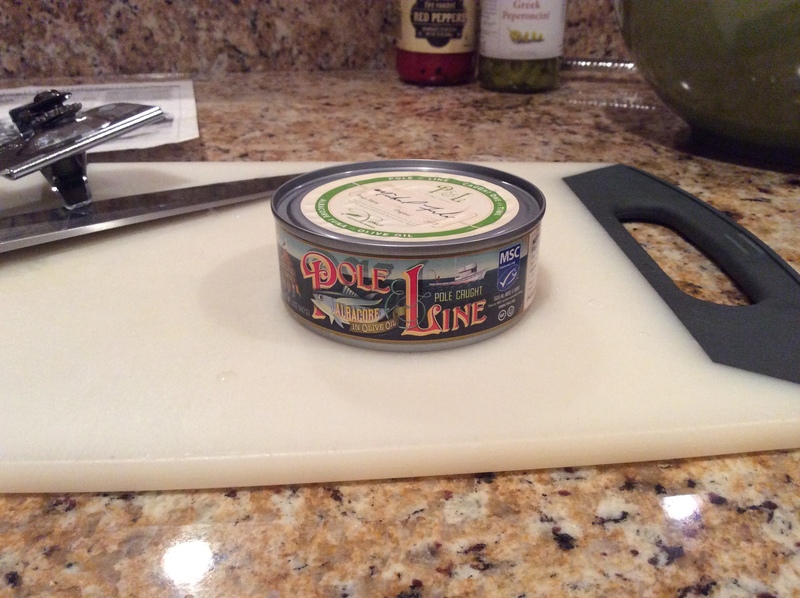 We went extra fancy this time and used “pole caught” wild tuna in olive oil. True confession: I bought it because the label was pretty. 4. Drain a 12 oz jar of roasted red peppers, dice the peppers, and add them to the bowl. 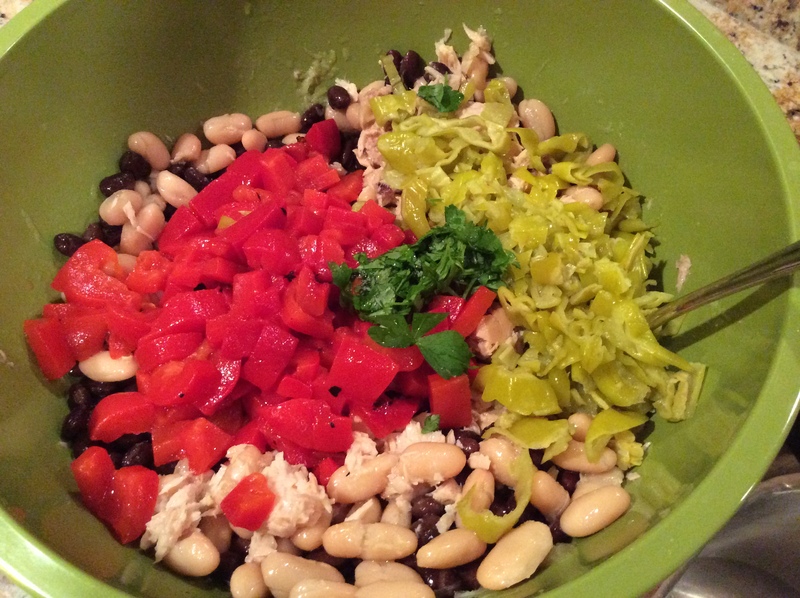 Do the same thing for about 1/4 cup of banana peppers or pepperoncinis, and add those to the bowl. Add about a tablespoon of fresh parsley to the bowl. Mix everything together. Salt and pepper to taste. Depending on how much olive oil was in your tuna, you may need to add an additional glug or two of oil to the final salad. Up to you. We used fresh parsley from our garden, but I’ve used a smaller amount of dried parsley (1-2 teaspoons) with fine results. If you use dried, this recipe might take 10-15 minutes because you’ll want to let the finished salad sit while the dried herbs reconstitute. 5. 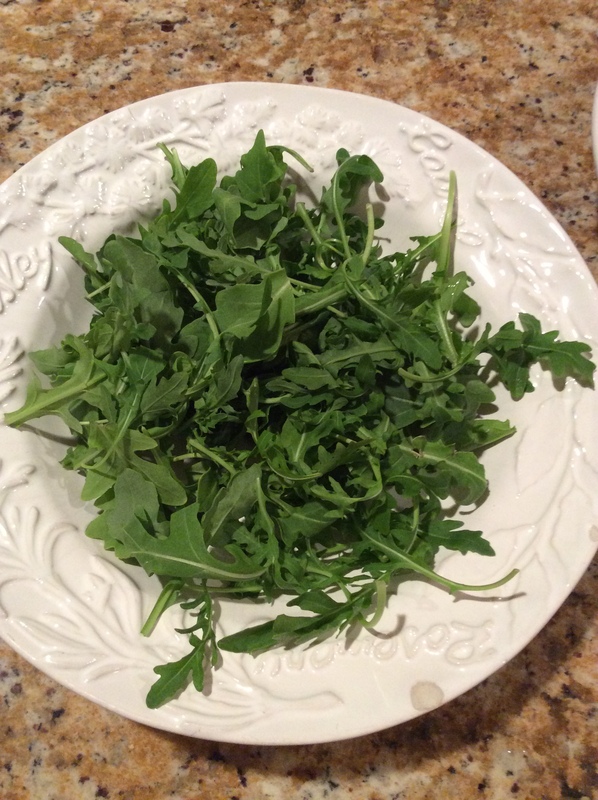 Put a bunch of arugula in a pasta or salad bowl. 6. 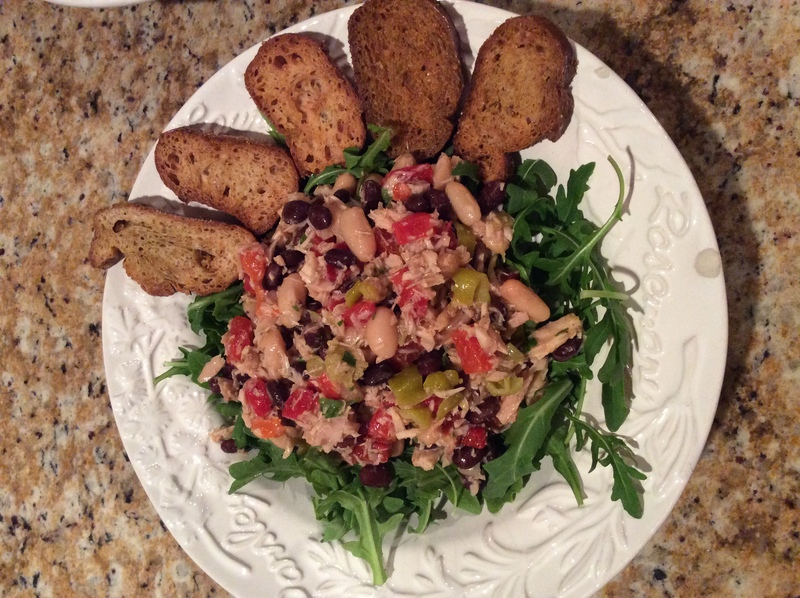 Pile on a few scoops of the tuna salad, and garnish with crostini (optional). Every year, Garden & Gun has a “Made in the South” contest. Products made all over the South are submitted for judging by a panel of experts in various categories like food, drink, style and design, etc. The winners are consistently fantastic, but many of them are also totally inaccessible due to price (hello $700 eyeglass frames). The overall winner in the drink category last year, however, was something normal people can actually buy, and something I actually own. Yay! I thought I would review it for y’all. *True confession: just in case anyone thinks I’m a snob about this, I think Mr. and Mrs. T’s spicy bloody mary mix (available at practically every grocery and liquor store) is one of the absolute best mixers out there. We kept that company in business tailgating in college.